Lee started his career in the concrete industry in 1977 working for successful residential contractors in the Arizona market. His experience included form work, concrete placement and finishing, estimating, project management, and operations management. In 1989, Lee cofounded Hardrock Concrete Placement Co., Inc. with his brother Larry. They started with small commercial projects and their offices were based out of their childhood house in Peoria. As revenue started to grow, so did their need for office space. In 2000, Hardrock built and moved into their current office, a concrete tilt-up building, in Phoenix. 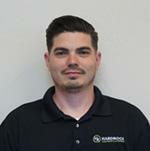 Lee has always been a “hands on” owner and stays involved in all aspects of his organization, including Accounting, Estimating, Project Management, Purchasing, Business Development, and Field Operations. Because of Lee’s past experience in field operations, it is not uncommon for him to visit a job site and “put on his tool belt” to lead by example and educate his crews. Lee’s vision, experience, hard work, determination, dedication, and leadership have been the most significant factors in Hardrock’s success over the past 26 years in business. Cindy started her career as a commercial ad valorem property appraiser in 1991. Cindy worked in the appraisal field for 7 years focusing primarily on commercial properties but also spent a year working as a residential property appraiser. Cindy joined Hardrock in 1998 as an Estimating Administrator and Lee Lopez’s Executive Assistant. Cindy was promoted to the Supervisor of the Project Coordination team in April 2000. In 2002, Cindy moved to Tucson for a year to manage the Tucson office and update their procedures. During this time, she started working on a large project job site and began learning Estimating which was a natural transition with her appraisal background. Cindy worked as an Estimator from 2004 through 2007. 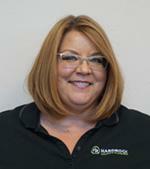 In March, 2006, Cindy was appointed Vice President as she continued her duties as an Estimator. During her employment she never was far from Lee’s mentoring and education on the “big picture” of the organization. In July, 2007 Cindy was appointed General Manager. Cindy has remained flexible in her duties at Hardrock. Her background and experience allow her to adapt to the changing needs of the organization and step in to help different areas and departments as needed. Cindy holds a Bachelor’s Degree in Finance from Arizona State University. In 1980, Dean earned a Bachelor of Science Degree in Accounting from Minnesota State University Moorhead. In 1981, he became a Certified Public Accountant in the state of North Dakota. Dean joined Hardrock as the Controller in 1998 and is involved in the financial aspects of other Lee Lopez owned entities. He is a Certified Public Accountant in the state of Arizona and has worked in both public and private accounting since 1981. He is responsible for Hardrock’s financial operations ensuring that the company’s financial performance is properly measured and reported on a timely basis. He is extremely proud of the hard work and dedication shown by the individuals comprising the Hardrock accounting team. Pablo joins the Hardrock team with a very diverse background in management and safety. He is a highly respected Air Force Veteran with a thirty plus year tenure between active and reserve Fighter Wing combat units. He has experience in international, national, and regional field and management levels. He retired as a Command Chief Master Sergeant. Leadership roles range from maintenance Chief to superintendent in Bagdad Sather AB Iraq. In the last 4 years, he was involved in logistics and safety cargo operation in Afghanistan moving thousands of pounds of cargo throughout the theatre for US troops in forward operating bases. He has a unique and innovative approach to the many disciplines in Safety and Risk Management including the disciplines of cost containment, manpower, and material savings. He continues to demonstrate expertise in team building, training, leadership, quality assurance, safety and equipment operations. 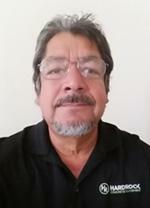 Pablo has been an OSHA U.S. Department of Labor Authorized Construction Instructor for the last 12 years including spending 6 years performing safety in the residential and commercial private sectors. He received a Bachelor Degree from Park University in Management and has completed various military Senior Leadership courses in preparation for challenging positions throughout his career. Mr. Valverde is a member of the American Society of Safety Engineers and continues to expand his knowledge in the field of safety. 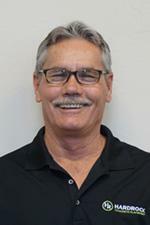 Terry has been in the concrete industry for over 30 years. He started in the residential market. When residential slowed down, Terry turned his attention to the commercial concrete industry. Terry started his career at Hardrock as a carpenter in 1997. He was promoted to Foreman in 1998. Terry’s supervisory skills earned him the title of Superintendent in 2001. After completion of several successful projects, Terry became a Hardrock Project Management in 2005. Terry’s experience and hard work earned him the position of Operations Manager in November of 2009. Terry has also attended Rio Salado College completing courses in AutoCad, Advanced AutoCad, 3-D AutoCad, Drafting I, Drafting II, and Drafting III. 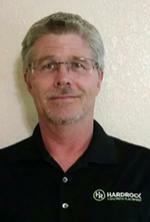 He is ACI certified as a Concrete Flatwork Finisher & Technician, a certification he has held for the past 9 years. Robert joined the Hardrock team in 1997 in an entry level field position. His hard work, dedication, attention to detail, and problem solving skills quickly moved him through the ranks of carpenter, foreman, and superintendent. He remained at the Superintendent level from 2001 to 2005 when he was brought in to the office to work with the estimating team. He is now a seasoned Estimator and Project Manager. Robert has worked on projects all over the southwest for the private sector and military. Robert attended Estrella Mountain Community College for Business Management. He is an ACI Certified Concrete Flatwork Finisher & Technician. He also holds an OSHA 30 certification. Abe started his construction career in 2003 working as a Superintendent for a large residential home builder. After gaining a few years’ experience on the residential side of the construction industry, Abe decided he would like to get into commercial construction. In 2007 Abe began working as a Project Engineer for a Phoenix area concrete subcontractor. Abe’s hard work paid off and during his tenure at that company he was promoted to Project Manager/Estimator. Abe joined Hardrock in 2012 as an Estimator. Abe has become a valuable member of the Hardrock team. He is the go to Estimator for our Tilt projects and has also performed Project Management roles when necessary. Additionally, Abe trains and mentors junior estimators coming up through the ranks. Abe holds a Bachelor’s degree in Business Management from Devry University. Jim started in the construction industry at the age of 17, working for a national formwork and shoring company. By the time he was 20, he was building wall forms, columns and flying tables at a small forming company in the Chicago area. At 28, Jim joined the Chicago Carpenters Union. For the next 3 years, he was working for a General Contractor building hi rises in downtown Chicago. Jim then signed on as a field technician for an international formwork company in their Chicago division. This job consisted of traveling throughout the United States helping companies learn the formwork systems for wall and deck forming, including building and training self-climbing systems, and troubleshooting any adverse conditions involved with high profile projects. Jim moved to Phoenix and began working for a local concrete subcontractor for 3 years. He took a hiatus from construction for a few years but decided to join the Hardrock team in 2012 as a Superintendent. He worked on several structural concrete project for Hardrock as a Superintendent and in 2014 was promoted to Project Manager. Juan started his construction career in the residential market in 2000 as a labor. He was quickly promoted to Carpenter and Lead Man. Juan continued to work for local Phoenix area concrete subcontractors for the next 5 years. Juan joined the Hardrock team in 2005 as a Carpenter. Juan’s hard work and dedication landed him several promotions over the years from Foreman to Superintendent. Juan is a skilled equipment operator, has expertise at various formwork systems, and experienced in decorative concrete. 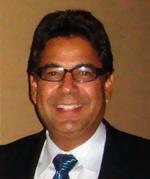 He has managed several projects as a Superintendent in Phoenix and New Mexico. Juan was promoted to Project Manager in 2015. Juan also holds an OSHA 10 and 30 certifications, as well as other certifications in fall protection, excavation and trenching, and hazard communication & GHS. 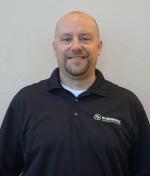 Dave started his construction career at a residential framing contractor in Lincoln, NE. He worked summers and part-time while attending the University of Nebraska at Lincoln. Dave earned his Bachelor Degree in Construction Management in 1998. After graduation, Dave went to work for a National General Contractor where he worked for 16 years building projects in California and Arizona. During his time there he worked as a field engineer, office engineer, and project engineer prior to becoming a Superintendent. Dave was highly involved in the company's self-perform concrete work as well as responsible for managing subcontractors. Dave decided to follow his passion for concrete and moved to the concrete subcontractor side of the industry where he can focus on what he loves. Dave is experienced with all types of concrete projects. He has worked on multi-story residential, medical facilites, university projects, parking garages, and airport transit work. Dave joined the Hardrock team in 2016 as a Project Manager. Frank graduated from Arizona State University in December 1975 with a Bachelor of Science Degree in Construction Engineering. After graduation, Frank began his over 40-year career in the construction industry working for a General Contractor in Tucson, AZ. After a several year stint in Tucson, he moved back to Phoenix where he worked for a few local General Contractors over the years. He was even in business for himself as a General Contractor for a while. 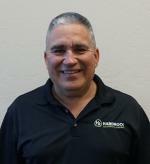 Frank made the move to the subcontracting side of the business by joining Hardrock in 1999. With Frank's vast experience in the local market, he is a great asset to the Hardrock team. 6360 S. Del Moral Blvd.